To make good photographs on or in snow, in the mountains and on glaciers you have to expose for the subject–not the scene. If you have no subject, as in a landscape image, over expose one stop, or 0+…1 in your viewfinder. This is necessary when making portraits in snow as well. Alaska photography consists of making photographic images in high-key or snow condition for six months of the year. Automatic camera setting are useless and will expose the snow to look dark gray. Thus the reason to overexpose the image by at least one F/stop. Example, camera reading is F/16 or it reads a marker at the zero and looks like this ( -1–0–+1 ). You will need to manually set the F/stop one stop brighter to F/11. With automatic camera settings with +plus 1 or more. Remember this suggestion is more relevant to “Shutter” or “Time” priority exposure, thus the F/Stop reference. While shooting aircraft portraits in action for Alaska photographs on snow I use a high shutter speed, but not high enough to stop the propeller movement. Try making portraits in the snow but be sure to keep the sky out of the image if possible. Remember one-stop or more in broad daylight, and a bit less for flat lighting. 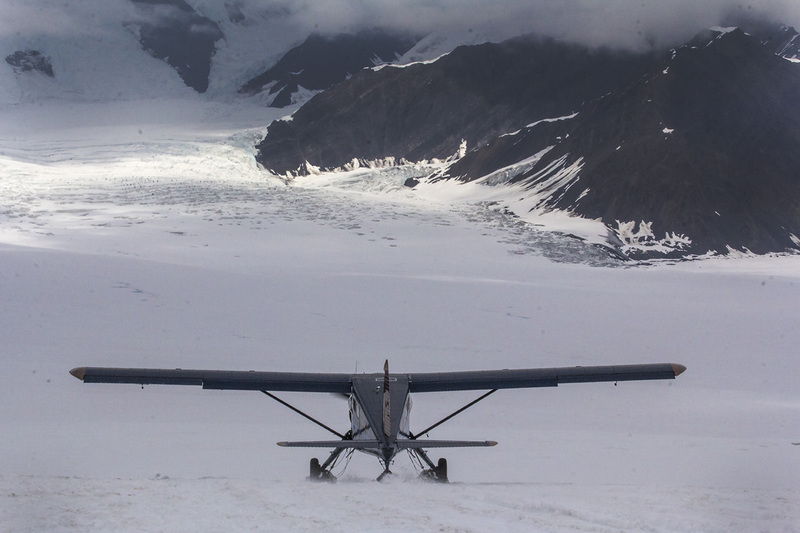 This aircraft image taken on the Ruth Glacier has both snow, sky and daylight in the background so exposing this was doubly difficult aircraft photography. While the subject is of the aircraft, the drama of the glacier bowl in the top of the image with daylight made this more interesting. Practice this exposure technique by placing a dark or gray object on a piece of white paper in bright light with most of the image being white around the object. Once you make the exposure review the image, then open up the exposure by one F/stop or +1 in the viewfinder, then try +1.5 and see the difference.